THE AIRHAWK® ADVANTAGE: POWERFUL MEDICINE BUILT INTO EVERY SEAT. The AIRHAWK® Comfort Seating System distributes your weight equally over the entire seating area, minimizing those hot spots during long rides. An integrated pump and bleeder valve lets you easily adjust the amount of pressure while seated, allowing you to adapt your seating position to changes in the road surface, temperature, and overall time in the saddle. AIRHAWK air cells also provide shock absorption for your pelvis, seat, and spinal column. Most AIRHAWK® seats are available with a rider backrest receiver and a range of accessory options. 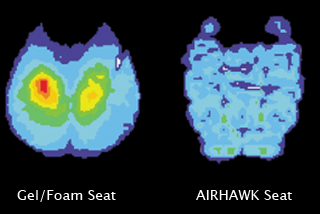 •These pressure-mapping images illustrate how our AIRHAWK seats adjust to your body to eliminate painful pressure points and increase riding comfort.